All natural, no preservatives, made in the USA. A complete food source for orphaned or rejected kittens or those nursing, but needing supplemental feeding. Also recommended for growing kittens or adult cats that are stressed and require a source of highly digestible nutrients. 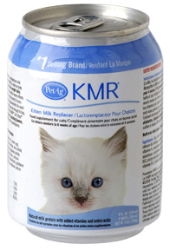 KMR is a complete diet for kittens fortified with vitamins and minerals. KMR's life saving formula closely matches mother's milk in protein and energy and also contains taurine.